Like most cat owners I don't know the date of your birth, which somehow doesn't seem important now. No, now that you have left this world, remaining only in photos and my heart, that date isn't important. I don't even know the date you arrived in my life. But before I get too wordy here on all that, let me say when the day we heard a meow outside my bedroom window (which was on the ground floor of my new apartment), we had to investigate. The "we" was my youngest daughter, Holly and I. We went outside where Holly was able to grab you and bring you inside. Although I do not remember the date, I do vividly remember our first night together. Holly had asked me if I was going to keep her, it didn't seem likely since I already had my two cats. That first night, you slept cuddled in the crook of my arm. Why you know I just loved that, and so in the morning while loving on you, I asked you if you want to live with me? The answer seemed a big YES. But what was I going to do. Decisions had to be made, for only two pets allowed to apartment. I watched the three cats and how they were with each other. While Mickey and you got along together in an apartment, Evie wasn't happy. Some of this with Mickey was that I had him neutered shortly before the trip because I knew his being an indoor/outdoor cat had to end. I was working part time at a TV repair shop. The shop owner's girlfriend was from the same area in New Mexico I had come from. When I shared my need for a cat decision, she told me they were making a trip there soon, and would be glad to Evie back with them, if that would help. So, after telling Mark my decision, the time came for Evie to go home. This turned out to be a wonderful blessing for both her and my old landlords back there who took her in. As for you, my Phoenix cat, whom I had named Precious, it was time to schedule the needed surgery. From records I've kept, this was February 14, 1992. It was now Mickey, Precious and I, and we got along well, though I have to admit you never did sleep and cuddle with me like you had that first night. Did you know how to worm yourself into my heart or what! Little did I know then how important you would become to me. Time sped on, as it does, most of it a blur right now. We eventually moved to a Glendale, Arizona studio apartment. Mickey was not doing very well, getting sick quite often and I wasn't sure but that it would soon be just you and me. A change in diet over months helped my loving Mickey. I'm ashamed to admit it, but I had used up all the money I'd brought to Arizona with me. That's why we had to get a studio apartment. It's why shortly after this, I was on welfare and food stamps. It was brought to my attention a company that brought pet food to one's home. So I began feeding you and your brother Diamond Brand senior dry food. Car accident #3 in 92 slowed my movement and increased my pain. Still I felt if I worked hard enough with exercise, etc. I would feel better in the future. I made it as comfortable as I could for us. We made it because of prayer and help from Holly. In the fall of 93 Mark came for a visit, a visit that lasted until 2004. But this isn't about others, it's about your and my relationship, dear Precious. In 1995, after hip replacement surgery and a 4th car accident, I began praying to get out of this dirty polluted city. My health seemed worse. While my body was suffering my spiritual life grew by leaps and bounds. By the end of June with my attorney's help (about the 92 accident and to qualify for SSI) the money came so we could leave Arizona and we did. Again Mark was there to help with the move, and surprisingly Holly decided to leave the valley of the sun behind too. Off we went, Mark driving the U-haul truck towing my car, Holly driving her Honda and Mickey, Precious, Little One (she's another whole story) and Chauncee, Holly's newly adopted puppy. For 7 weeks we lived in a tent there in Colorado Springs. It was a challenge for all of us. Mark had to remain at camp to watch over the critters; while Holly and I searched for a home we could afford. Gees, here we were, me with some money once again, and no credit; she with little money and good credit (well kinda). August of 1996 we moved into our mobile home in Colorado Springs about 4 miles from where Marcy and Howard lived. You and I, dear little girl, lived together but can't say I really knew you. Oh there were bits and pieces - like when you did your poop in the litter box you failed to bury it, and left the area with lightening speed down the hallway. Mark and Holly stated your poop was the stinkiest ever. Also when you ate, you always left crumbs around the little table Mark built for you. Little One seemed happy to do clean up after you. For several years three cats, a dog and three humans lived together. Can't say we all got along beautifully, maybe it was because none of had a real goal. 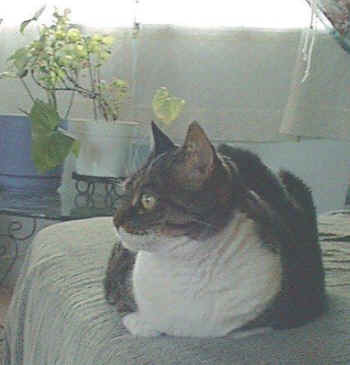 In 1997 I began fostering cats for a woman I only met via the phone. I enjoyed fostering, helping cats and kittens until a new home for them could be found. I especially liked the fact that I could choose the new owners because they came to my home. As of June 13, 1999 I had fostered and adopted out 34 cats and kittens. This came to an end when Sally Ann, an all black pregnant cat arrived. Her babies were born in my bedroom - two boys (Deter and Dusty) two females (Daisy and Donna). This is another whole story - one I may tell at a later date. For as the reader can see and may wonder at this point - what about Precious. You, dear little girl seemed very independent and took in stride all the new visitors both human and cat. I loved you, and occasionally you'd sleep with me, still we were not close. Our closeness would come later. I had to be close to Dusty and Deter because they were born disabled and needed special, personal attention.. So, no, Precious, you were just part of my family. Your independence remained. You were quite the young lady. If you wanted attention, you asked for it, which wasn't all that often. Then came the decision in 2004 to sell my home and move to the East Coast. Preparing for the plane trip to Maine, I had decided Deter would be with me in the plane; while you, even though you were nearly 12, would ride in cargo. But when the time came I reversed this decision. It worked out well; our bonding began. Here in our Maine room, you, Deter and I grew closer. We were bound to because I stayed in our room with you both so that you would get use to our new life. Now I had two bed buddies. Depending on the weather, the two of you chose where best to sleep. During the warm weather Deter enjoyed sleeping in the window, while you slept in your spot next to my pillow. Cold temperatures had both of you searching for warm comfort. You enjoyed the blanket cave I made for you; Deter wanted to get under all the covers and sleep glued to mom. You also enjoyed sleeping on my chest, my abdomen, or legs. The latter just wasn't comfortable for me, so I'd try to kindly indicate you should move. You know the sudden and continual movement of your nest behind my legs. We did great, then there came a time when I noticed you weren't eating as much as usual. Moms notice those kind of things. Even though money was tight I took you to Dr. Temm's office. It was June 15, 2005. Blood work was done and I was told surgery could tell them what was wrong with her intestines. You, my baby girl were too old to undergo such surgery, just for a diagnosis. The other choice was to try a drug to see if it would help. Tiny though they were, and even with Lori and Holly's help..........we could not get your jaw open. You were very stubborn about this and I had to tell the vet's office this. So, they told me if I brought you in at 7 A.M., their vet tech would pill her each morning (well 6 mornings, since they weren't open on Sundays). We made many a trip through the neighborhood to the office; you in the pet taxi strapped to the luggage carrier - you crying the whole way. Guess you weren't too loud cause none of the neighbors complained. The vet techs found out about your jaws of steel. It was not going to be easy to get a pill in you. The medication worked for a while, and then nothing. You were now on a prescription food, and that only could you eat. I had to learn a hard lesson, when one day having cooked a turkey breast, I'D cut up some of it to give to you. A mom will do almost anything to help her baby, and you wouldn't eat your special food. You loved the turkey, but the pleasure was short lived as it made you very very sick and I had much mess to clean up. Your doctor, Dr. Morin warned me about this, and from that point on no more people food or any other pet food for you. A year had passed, and even with the prescription food you were now getting sick nearly every day - vomiting and having diarrhea. A phone visit with Dr. Morin about my concerns for you resulted in her suggesting trying steroid injections. They won't heal her, but I've found them to extend life for months, even a year. With your permission I'd like to try this. Steroids to me were a BIG negative - having heard about athletes using them, but Dr Morin assured me they were not the same kind. And so in June of 06 began an experiment with your body. Would the steroid help or hinder? I was excited to see it helped you to have a good appetite and solid stools for over a month. The sparkle in your eyes told me you felt great. You repaid me by trying your best to help me sleep. Nearly every night that I wrestled around trying to fall to sleep because of my pain, you came up to my face, washing me like your kitten. You'd often lie across my throat, like a muffler. Many a morning I'd awake to find you there. You had taken on the role of my personal nurse. Over the months we depended on each other. The positive results of the steroid weren't lasting as long, now only about ten days. I had to stretch it out to two weeks because Dr Morin had said she had no problem giving them to you every two weeks. I would pray about this, and felt that as long as I saw the desire to live in your eyes, the Almighty Heavenly Father would provide the money for your care. You and Deter had canned food in the morning. He marched into the bathroom to his little table, and you hopped up on the hamper/scratching post, both eager for breakfast. Those times when I tried to stretch out the days to the needed two weeks, I would finger feed you. While you may or may not have ate a morsel or so from the dish, often by offering it to you on my finger, you'd eat it all. At times I think you took advantage of being hand fed, something Lori wouldn't do the week I went back to NYS for my 50th high school class reunion. She saw it as spoiling you. As mom I saw it different, I was trying to keep you alive. If you refused what was on my finger, I'd often smear it inside your mouth. At least you'd have to lick it off and it was "some" nutrition. Once I went against my own judgement and forced food into your mouth. I didn't blame you for biting down on the intruder, and didn't repeat this. For an old gal you sure had sharp teeth and nails. And for the many times you were sick, it was hard, and I often complained to myself about cleaning up after you, but even times when you watched me do this, I didn't scold you, no not at all. You couldn't help it, you had Inflammatory Bowel Disease. Mom had compassion because she also had colon problems. There were several nights when you had been so sick I thought I'd find you dead on your spot on our bed. The ups and downs were tough on us both, and I knew, just knew that one day, like the heart monitor that goes to a straight line, the ups and downs would end. Your last injection was on September 4th, as in weeks before I started preparing myself for your appetite to decrease and your elimination to become loose. Ten days, eleven, twelve, two weeks went by; you were feeling great. You began exploring the living room, porch and kitchen. It seemed a miracle had happened, everything was working well in your body. I didn't know what to think, as I was use to your ups and downs. I carried on my daily routine with a continual checking on you. As I had done for months, I kept some of your dry food in a sealed plastic container on my dresser. It was for those late night, or early mornings trips of mine to the bathroom, when you'd indicate you were hungry. Three weeks had passed and you were still doing great. Another move was ahead of us Precious. I finally got a call from The Pines in Ocean Park, an apartment was available – did I want it? I had made the decision that when I got the senior apartment I would take you with me, and leave Deter here. Lori was okay with this, but I agonized over basically living in two places simply because the management would only allow one pet. Even a letter written by Dr. Morin had no effect. I would live with my decision, and no matter how long you wanted to live, I would do everything I could to make that possible. With each day, and prayer, I knew it would be not only possible, but I would be given the strength to do it. By the 24th you began eating less, and then by the 25th, I noted you had not had a stool. Watching you like a mother hawk, I had to acknowledge you had lost weight. I'd pick you up several times a day, we'd hug and even though you had been deaf for months, I'd tell you "You're my sweet baby girl" You understood. You also liked being brushed every night, especially scratching you chin and face on the brush. You enjoyed the attention, you enjoyed life - we bonded like mother and child. I knew one day I might have to make the decision to end your life, but the actual doing it, well could I let you go. Wednesday morning I was going to the farmer's market, so I put both of you in for a morning nap. I got home and busy re packing things in the cellar when the phone rang. I had forgotten my chiropractic appointment, so off I went. Once home again I opened our bedroom door to check on you, my sweet girl. You sat on the chair watching me as I looked around at the vomit and drops of diarrhea. I knew you felt both embarrassed and sick since you didn't ask to get out. Nor did you ask for food. I picked you up to find your back quarters were dirty. Putting you down into the litter box, you sat, then laid in there for some time. What could I do for you, what was the next step? By that evening I found that you had been sick in your beddy, as well as, both rugs, so I cleaned them up and washed them. I brought up the larger pet carrier as I thought it would be better to put you in there for the night. Before I put anything in it for you to sleep on, you walked in and fell asleep. You seemed so tired. At bedtime I told myself I wasn't going to cage you up, instead I put a towel where you liked to sleep on the bed, right next to my pillow. Once the lights were off, you notice Deter and I are ready to sleep and hop up and make yourself comfortable. I pet you and tell you and Deter good night. What would I find in morning, or would we get any sleep at all? I was beginning to be both nervous and scared. You were no longer the bright eyed girl I had gotten to know since in Maine. Morning dawned. You were not on the bed, no mess around the room. Had you died during the night? I was almost too scared to check on you in the other cat bed under the bed. I went about my morning routine thinking that once you felt movement in the room, you'd come out. You didn't. You had not eaten since Wednesday morning. Something was terribly wrong. I pulled out the bed, you just lie there so tired, lifting your head to look at me, but no effort to get up. My gut feeling said to call the vet's office to tell them the time had come. I did, even being able to talk with Dr Morin. I told her Precious is so tired, she doesn't seem to be suffering, just wants to sleep. The appointment was for 6:30 P.M. For Deter's sake I had to try to keep the morning routine. I had noted he wasn't much interested in eating the night before. He knew, probably more than I did, his sissy was very sick. I cried most the morning, then looked forward to getting out of the house to go to the YMCA's 11 o'clock pool class. I could talk to a cat owned friend there about all of this. Before leaving I dried the covering to your beddy and put it back on. It was your favorite. You needed everything I could give or do for you. Arriving at the YMCA I learned that the pools were closed because of the thunderstorm. Uninterested I went into the cardio room and walked on the treadmill for 20 minutes. All I wanted to do was cry. The class was canceled, my friend wasn't there. The pool opened up and I exercised for a half hour. No one to talk to, well maybe when I go to pick up my weekly milk, but once there, couldn't find Mr Cassette, so I got my milk, left the money and headed home. Would I ever stop crying? Home again, after putting everything away, I checked on you. You were in your beddy sound asleep. It was only 1 o'clock; 6:30 was a long ways off. I chose to go to the historical society for an hour just to get my mind on something else. It didn’t really help as off and on the tears came. This couldn't be happening, could it? I paced around like a caged animal. I prayed for the Father to take your spirit back and let you die in peace. Each time I checked on you, you were cleaning yourself or sleeping. The agony was getting unbearable. I couldn't concentrate on anything. Phoned a friend, but she wasn't home. I knew her husband could hear how upset I was as I told him what was happening. Lori arrived home. Holly came over. Both wanted to see you. Lori even offered you food. You weren't interested. You were to tired. Lori told me she would go with me, meet me at the vet's. They both left, I continued my pacing. How could this be happening? This isn't what I wanted or prayed for you. The minutes went by so slow. Was time standing still? About 6:15 I pulled you in your beddy out placing it on the bed. Deter was still sleeping. He seemed oblivious to what was going on. You sat up and cried. You cried as I took you to the car, still in your beddy. It wasn't a sad cry, a suffering cry.........just a cry of hello, maybe a questioning cry. Once down in the vet parking lot, I got out and went around to the passenger side, picked up the beddy and sat down. I wanted you to know I didn't want to do this. I wanted you to know how much I loved you. You had to know this wasn't what I wanted for you. I noticed Lori's vehicle pulled in next to mine. Apparently she didn't see me sitting there and walked into the office. I checked my watch. It was time. As I was carrying you, Lori met me. I was crying so much, yet I made it inside. The receptionist said Ms Cooper, we'll be right with you (or something like that). She was checking a woman out with her pet. The woman looked at me as she walked past saying "Good luck". She didn't know, she didn't know - luck had nothing to do with this. She was trying to be kind, I knew that. It was time to head to one of the rooms - I noted it was to be the furthest one back. Had I ever been in that one? You were wide-eyed and tired. Dr. Morin came in. I told her Yes, I'm already crying, been crying most of the day? I handed her a copy of the photo I’d taken months before of her holding you. She smiled. She said I'm only going to do this IF you're sure it's what you want". Oh, how I wanted her to offer to try another injection (learned Lori had hoped for this too), yet knew my sweet Precious had had enough. You were tired. You just needed help. Dr. Morin explained the first injection was a combination of sedative and pain killer used to prepare an animal ready for surgery. You weren't upset as she had stuck so many sharp needles in you. It didn't take very long. I grabbed Lori's hand and saw she was crying too. The box of Kleenex was nearby. Now she will get very relaxed, and go to sleep. I'll leave for a few moments. You continue to pet and talk to her. We did. We cried and cried. My Precious couldn't keep her eyes open, she was sedated. Now she could no longer hear us or feel us (or so her doctor said). You went to sleep in your beddy, Dr. Morin came back in the room, checked you, then said I'm going to take her out her bed for this injection. She picked up a limp rag of a cat, placing her lovingly on the afghan on the table. As she shaved a part of your back leg, I saw the vein. I hugged Lori; she hugged back. We cried silent tears, many tears. You don't have to look mom? No, I want to look, I want to be with her for all of this, just as I hope you'll stay with me to my end. The fluid seemed to take a long time. A lot longer than the steroid injections. Dr Morin checked you with the stescope, your heart had stopped, you had successfully been put to death. It was over. Over for you, my dear sweet Precious, but not for me. Not for Deter. You my dear sweet girl had a long life, lived in three states, met many a cat and a very special dog. You had been with me for over 16 years, yet it was the last two years we truly bonded. It was a period of our lives we needed each other. It was when you gave up some of your independence and let me love you.. Thank you for this, and for so much more. You will not be forgotten Precious, not just because I have photos of you, NO, because you made your way into my heart.